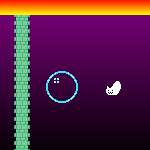 The Prequel to BUTTON MASH BOSS BATTLE....Sorta....Not really. No. And yes,I made another game. Yay. Experience the emotional rollercoaster that is childbirth in this in depth simulator from the creators of Super Clipboard Charity Botherer 2: Bother Harder. A brief adventure through Hell and back. Except we never actually get back. And we don't get very far through Hell, either. Come to think of it, it's not even called 'Hell' in this game. So, 'a brief adventure with an inappropriate title' then. Ever wanted to experience the highs and lows of being a charity botherer? Well now you can in Super Clipboard Charity Botherer 2: Bother Harder!! Take to the streets of an accurately recreated UK town and hassle passers by for spare change by retelling your most heart wrenching sob-stories. Caution: Game contains genuinely saddening stories about squirrels. Eat as many burritos as you can! Steal your friends burritos for double the points in this two player head-to-head fight for BURRITOS! First person to eliminate their score WINS!